1. The inclusion of “MAC addresses” in the list of discoverable items is a bit of a red herring. That can be found just by listening for ARP requests when on the same segment. That is never a private piece of data. 2. What is important concerning the nbtscan results is that since it uses a different protocol from listening to requests other than ICMP it provides a means to find servers that may have the ICMP (echo request) listening capability firewalled and thus show possibly “hidden” servers. 3. It is one thing to say “So from the security point of view it is recommended this service to be disabled”. However, what also needs to be stated to make this article even better is a) how to disable the services providing this functionality and b) the operational impact of doing so. Security does not and cannot operate in a vacuum and must take in consideration the real world requirements. First of all thank you very much Ken for your comment. For the first point you are right.This piece of information can be retrieved easily just by doing an arp scan.Also of course I am not consider the discovery of a MAC address as a private piece of data but it is an information that you can obtain along with other results from a netbios scan so that’s why I have mentioned that as well. Thank you very much for the feedback and the comment.It can help in the creation of a discussion about this matter! Thank you for this. 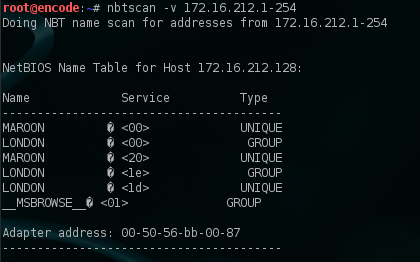 It should be noted that nbtscan only works in Linux but nbtstat works in both DOS/Windows and Linux. I don’t know why Microsoft doesn’t include a utility like nbtscan in their OS, or why I keep asking questions like that.